Lighting show designer Nick Gray of Renegade was back for his third London Collections – Men (LCM) SS14 fashion experience, where he lit the two main spaces at Victoria House and The Hospital Club in central London. All the primary British fashion Council (BFC) runway collections across the three show days took place in the basement of Victoria House, a fabulous warehouse space complete with original exposed features like pipework and ventilation plant. The place was whited out for the event as part of a high-impact scenic design by Bacchus. 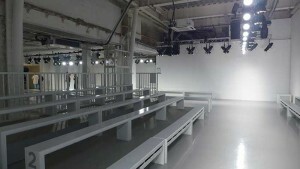 Gray lit it as a fully multi-purpose area which was also used for several static presentations in addition to the catwalk shows, emphasising ‘slick and cool’ as the desired ambience. The main technical challenge was in creating around 25 new rigging points in the ceiling and walls so mini-beam trusses could be installed in exactly the correct places to provide lighting positions. This work was completed by Outback Rigging after elaborate consultation with Gray and his team, after which Renegade commenced putting in the kit needed to light the workspace. The principal creative brain-teaser for lighting was to deal with the many different physical levels involved. 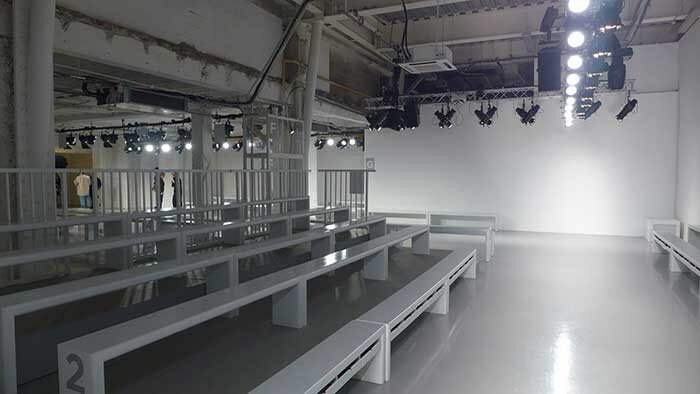 The intensities of each luminaire had to be meticulously tweaked and tuned to ensure consistent coverage and colour temperatures all down the catwalk and across the presentation areas – although the fixtures were at different heights and distances. The lighting kit was all supplied by Renegade and featured 77 ETC Source Four Profiles with different lenses and 44 Source Four PARs as the main sources, plus some Minuette Fresnels and two Martin MAC 700 Profile moving lights. They were all daylight corrected to match the aesthetics of Bacchus’s grey and white design. Renegade’s crew chief was Chris Fyfe and they also designed and installed an extensive power distribution and cable infrastructure. At the Hospital Club in Endell Street, Covent Garden was the core presentation and studio space for the LCM run of shows, and this also required lighting with a plethora of uses in mind, from static designer collections to an evening of Fashion Films presented by The British Fashion Council, Dazed & Confused and River Island. Gray chose a combination of 2k Fresnels and ETC Source Four PARs to create a variety of looks and cover the heterogeneity of installations. He also used around 30 500W Coda 4s to backlight material walls on both sides of the studio. All the lighting was again daylight corrected and Gray developed a distinctive lighting treatment for each installation. He comments: "I have been involved with lighting London Collections - Men since it started and seen it grow enormously acquiring profile and presence in a very short time – all very exciting! I like the opportunity to blend classic fashion lighting techniques with bold new experimental ideas to produce the fresh and vibrant looks for everyone using the areas."